However, keep in mind that Montana IS a big state - and has lots of hidden little gems in unlikely places. And even the more popular places, such as Glacier National Park, have many attractions few visitors ever see. Thus, if you don't want to miss something of special importance, it is not a bad idea to invest in a guidebook or two. Also, books specifically about Glacier Park and Yellowstone Park are located in seperate sections. Note, if you plan on venturing off the main highways, whether to simply explore or do some remote camping, the Montana Atlas & Gazetteer is an absolute must. Click any of the links or images for more information about each book. All books available through Amazon. Montana Road & Recreation Atlas - Anyone who plans to venture off the main highways in Montana should have a detailed map book. 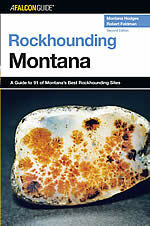 This Atlas covers all back roads and provides tons of other info about outdoor recreation in Montana. Highly suggested for anyone visiting Montana. DeLorme Atlas & Gazetteer Paper Maps- Montana Atlas & Gazetteer - This is another superb map book. The big difference between this one and the others available is that the maps in this Atlas are topographical. Frommer's Yellowstone & Grand Teton National Parks - Frommer's Yellowstone and Grand Teton National Parks is packed with all the facts, tips and descriptions you need to have perfect park vacation, in a pocket size guide. Moon Yellowstone & Grand Teton: Including Jackson Hole - The most popular Yellowstone and Teton Travel Guide on Amazon. Full of info about reservations, campgrounds, activities, restaurants and much more. Insiders' Guide to Glacier National Park: Including the Flathead Valley - This guide explores everything to see and do in Montana's Glacier National Park and the Flathead Valley. Readers will find insider information about such things as restaurant listings, accommodations, recreation, and relocation. Moon Guide to Glacier National Park - Written by a local hiking guide whose love affair with the park spans decades, Moon Glacier National Park uncovers the best ways to experience the rugged Crown of the Continent. Moon Montana & Wyoming - Detailed travel guide for exploring Wyoming & Montana. Strategic, flexible itineraries for visiting both states, including Yellowstone, Glacier, and Grand Teton national parks, curated for outdoor adventurers, history buffs, and more. The best road trips in Montana and Wyoming, from a 14-day Greater Yellowstone loop to a 7-day Glacier road trip. Much more. Montana - Off the Beaten Path - Montana Off the Beaten Path features the things travelers and locals want to see and experience––if only they knew about them. From the best in local dining to quirky cultural tidbits to hidden attractions, unique finds, and unusual locales, Montana Off the Beaten Path takes the reader down the road less traveled. Rockhounding Montana - Rockhounding Montana points the way to the best rockhounding in the state, including popular and commercial areas as well as lesser known sites on public land.